Pollokshaws is located approximately three miles to the south of Glasgow City Centre. The area began as a local Burgh before merging into wider Glasgow. 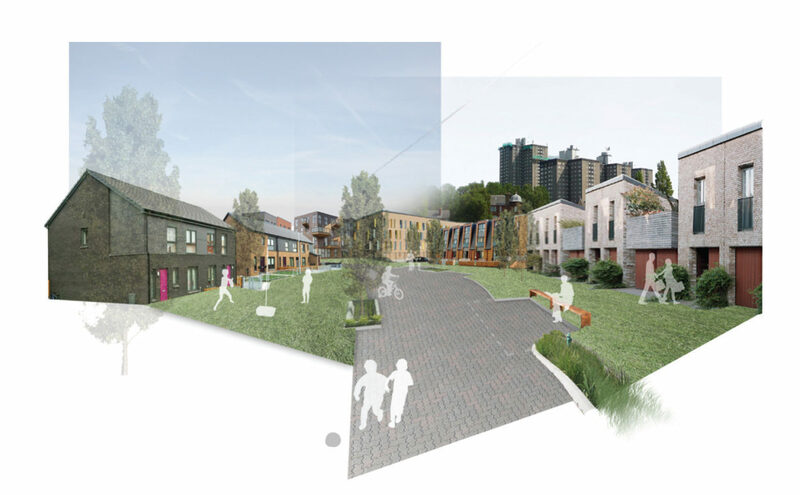 Initially a village of tenements, victorian cottages and businesses supporting a textile industry, this changed in 1957 when much of the original fabric was demolished and redeveloped into high-rise housing.The site area covers approximately 62ha and is currently heavily urbanised land with existing residential housing, high rise flats, large commercial buildings including retail, industrial and office premises. The area is bisected by several watercourses including the White Cart Water, the Auldhouse Burn and an un-named burn to the south. Connecting to Pollok Park - The site is located immediately adjacent to the Pollok Country Park and is home to the local Auldhouse Park. It is proposed that these parks be connected through a series of linear landscapes that follow the White Cart Water. Promoting Green Industry - The area to the south west of Pollokshaws is currently home to a number of industrial and retail units. 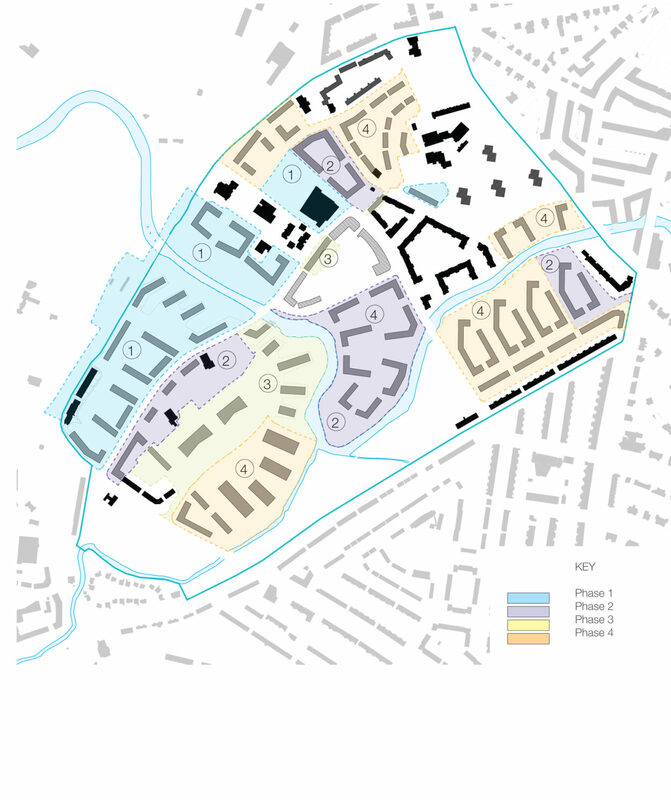 It is proposed that this area retain its present uses but be remodelled over the medium to long term to create a green industrial area that responds to the proposed surface water management strategy and wider place-making principles.A new green-blue route with permeable surfacing and planting runs through the centre, terminating at the community open space and facility. Green-roofed industrial work units overlook Auldhouse Burn and Park. New housing and live-work units are located within the area by Shawbridge Street, Nether Auldhouse Road and the White Cart Walkway. 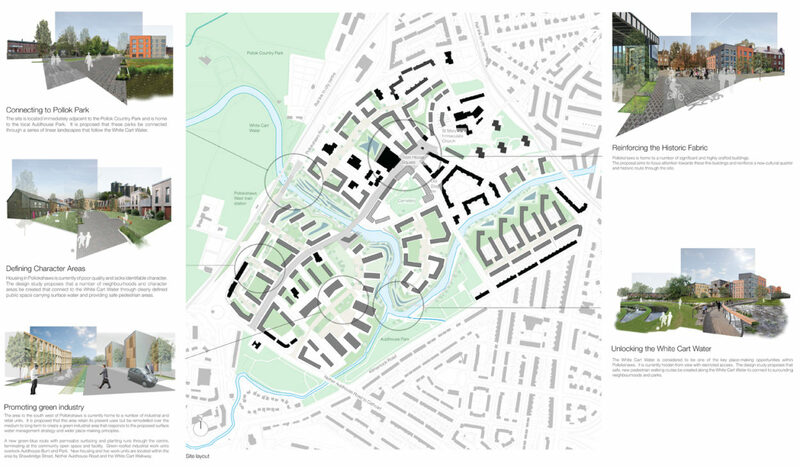 Defining Character Areas - Existing housing in Pollokshaws is generally of poor quality and lacks identifable character. 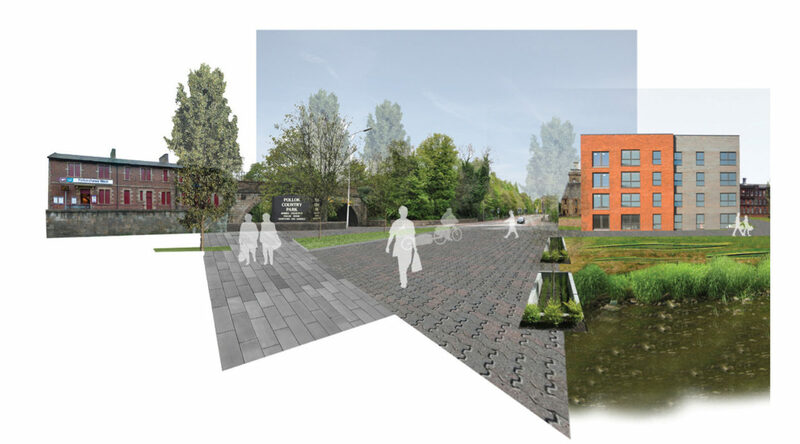 The masterplan proposes that a number of neighbourhoods and character areas be created that connect to the White Cart Water through clearly defined public space carrying surface water and providing safe pedestrian areas. 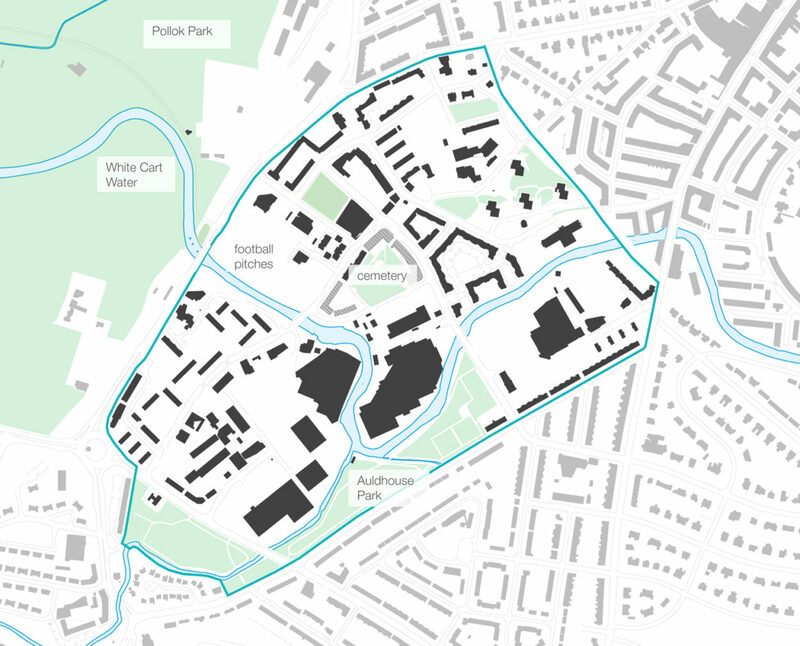 Unlocking the White Cart Water - The White Cart Water is considered to be one of the key place-making opportunities within Pollokshaws. It is currently hidden from view with restricted access. 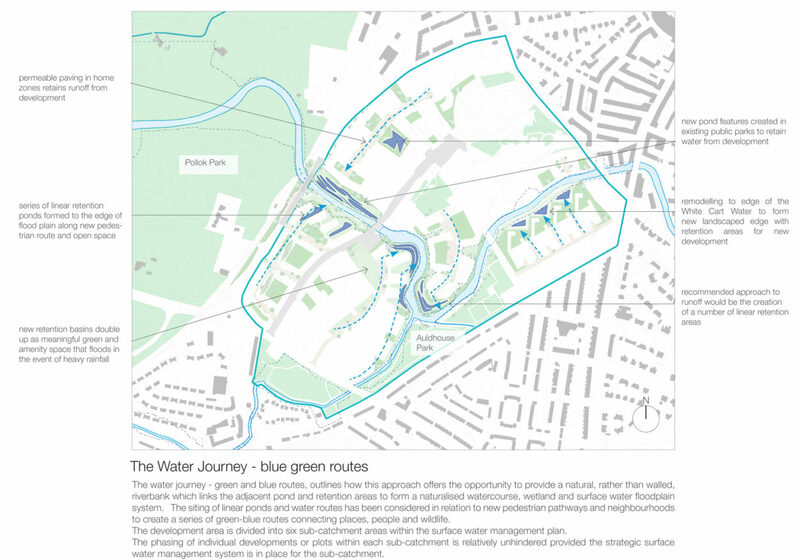 The masterplan proposes that safe, new pedestrian walking routes be created along the White Cart Water to connect to surrounding neighbourhoods and parks. Reinforcing the Historic Fabric - Pollokshaws is home to a number of significant and highly crafted buildings. The proposal aims to focus attention towards these fine buildings and reinforce a new cultural quarter and historic route through the site.